The ability to isolate and sort analytes within complex microfluidic volumes is essential to the success of lab-on-a-chip (LOC) devices. 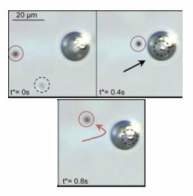 We have developed a method to achieve this using an acoustically-excited oscillating bubble. The selectivity is based on particle size and density, and arises due to the interplay between the drag force generated by the strong microstreaming around the bubble, and the secondary Bjerknes force which acts to attract the particle to the bubble. The cut-off, which dictates which of these forces dominate, can be altered by changing the bubble size and actuation frequency. Open fluidics is the study of small fluid volumes which are not enclosed in microchannels, but rather have large air/liquid interfaces. The simplest example is a droplet on a flat surface, but this term can also cover cases such as ribbons of fluid, thin films and flow in grooves. Advantages include easy access to the liquid volume, minimal dead volume (no pipes to connect to channels) and simple component manufacture. The behaviour of such systems is greatly affected by surface tension and contact angles, with spreading and flow of fluid being active research areas. 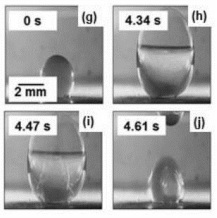 A sequence of images showing the growth and rupture of an encapsulated bubble within a droplet. Liquid jetting as the bubble ruptures causes a transfer of liquid onto the upper surface.